The summer of Legendaries has fallen upon Pokemon Go players. 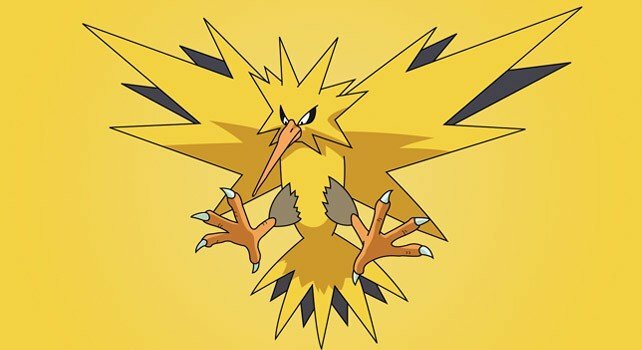 Niantic's popular AR-based hit has once again gained an all-new adversary in the form of Zapdos, an Electric- and Flying-type Pokemon that will serve as the game's latest Raid Boss through August 14. Taking down Zapdos won't be as easy as past Legendary Pokemon, however, as Zapdos has fewer exploitable weaknesses. Still, determined players who can put together a solid crew should have no problem taking down Zapdos with a little bit of strategy. Zapdos represents a different sort of challenge for players looking to add the Pokemon to their ever-growing roster: though it has a relatively lower defense stat than some of the other Legendary creatures to arrive in Pokemon Go, Zapdos has half as many weaknesses as other Legendary Pokemon. Ice and Rock are Zapdos' only two weaknesses, which means trainers will want to put together a team that focuses on Ice- and Rock-type abilities. Players can always bring along their best Ice-type Pokemon, particularly Jynx, but it's best to avoid bringing along creatures that are weak to Electric. Rock-type Pokemon are also good choices, particularly ones that are also Ground-types. Naturally, this means Golem and other Pokemon like Rhydon will make for good choices to take down Zapdos. Other decent choices would include Pokemon like Dragonite, which can resist Zapdos' attacks, and Tyranitar, specifically one with the Stone Edge attack. As a Raid Boss, Zapdos in Pokemon Go has a CP of around 28,000. And, like with other Legendary bosses, Zapdos has a base capture rate of just 3%. Still, players can bring along items like Razz Berries and Golden Razz Berries to increase the capture rate up to just over 23%, which means players should be able to nab Zapdos in five or so Great Throws. With a bit of skill, patience, and forethought, players should have no problem taking down Zapdos and adding the Legendary creature to their lineup. Even better, Zapdos would be a stronger counter against Ho-Oh, assuming rumors of it coming to the game next week are true. We've got loads more crucial stragies and how-to guides featured over on our Pokemon Go tips and tricks guide hub.